Board-Certified Facial Plastic Surgeon, Dr. Anna Petropoulos, is a skin-tightening pioneer, and has been using radiofrequency treatments for skin tightening and contouring for more than 15 years. She has become an authority in minimally invasive aesthetic treatments that use the latest medical technology. Is dull, lax, unevenly colored skin giving you a tired look in spite of your youthful energy? Sun exposure and the passing of time have a way of robbing the skin of its firmness, smooth texture, and natural radiance. Dr. Anna Petropoulos offers a safe, non-surgical solution: Fractora fractional radiofrequency skin rejuvenation treatments. Boston-area residents rely on her for the latest skin renewal options and trust her for her specialized expertise and warm, caring personality. If you’d like to speak with facial rejuvenation specialist about radiofrequency facial rejuvenation, request a consultation online with Dr. Petropoulos, or call her at 978-739-9500. She looks forward to exploring your treatment options and developing a personalized plan to help you look and feel your best. Fractora™ can deliver improvements in symptoms of aging skin such as deep lines, texture, blood vessels, fine lines, pigment irregularities, and redness. Using different technology would require multiple treatments to achieve the same results as fractora™. 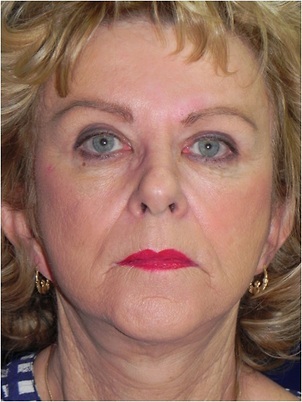 With a single Fractora treatment, Dr. Petropoulos renewed this patient’s complexion, skin texture and firmness. 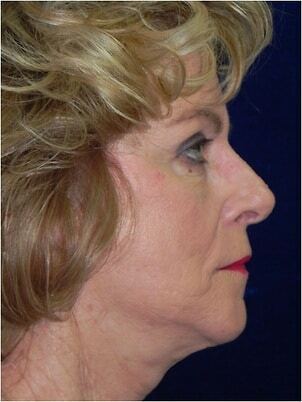 These profile photos show the patient’s more defined jaw line after her Fractora treatment with Dr. Petropoulos. Fractora is an advanced treatment that delivers radiofrequency (RF) energy into the skin to gently eliminate excess pigment and heat tissues for renewed collagen production. Fractora™ treats pinpoint areas of the skin while adjacent areas are left untreated. 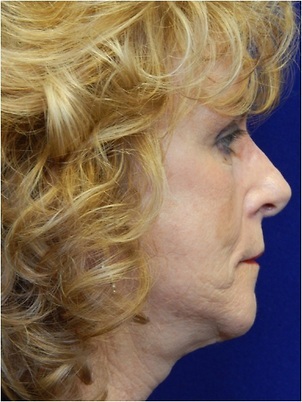 This is similar to the way Fraxel® and other fractional lasers work. Because the entire surface of the skin is not treated, the skin heals rapidly and downtime is minimized. Dr. Petropoulos will customize the treatment to the patient’s aesthetic goals and target areas by adjusting settings on the Fractora™ system and changing tips on the handpiece. Both Fraxel and Fractora™ devices use fractional technologies, but at different wavelengths, to achieve results. Fractora™ uses radiofrequency energy to stimulate the regenerative process. 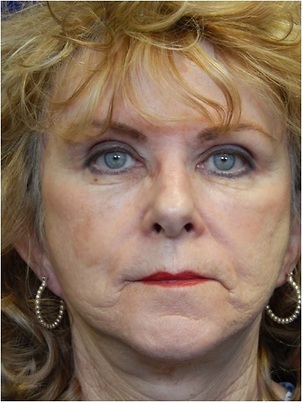 The Fraxel laser uses light energy for collagen production. Fractora is more effective and can be used on all skin types safely. We perform Fractora™ treatments in the comfort of our relaxing office setting. To ensure utmost comfort for our patients, we begin by applying topical or injectable numbing medicine. Once the areas are prepared and the appropriate Fractora™ treatment tip is selected, Dr. Petropoulos applies the handpiece to the skin as it emits quick pulses of RF energy. Patients feel a warm or hot sensation as the RF energy permeates the skin. To ensure optimal results, we make multiple passes over each area. While the total treatment time varies with individual patient needs, sessions typically range from 45 minutes to 2 hours. Afterwards, treated areas will look red, puffy, and shiny for about a week. It’s important to keep the skin moisturized and protected with an ointment such as Aquaphor®. While improvements may appear right away, the most noticeable changes will occur over the following 2 weeks as collagen in the skin renews. This gradual transformation may continue for up to 2 months. For best results, we recommend a series of 1 to 4 treatments, spaced 3 to 5 weeks apart. Our Fractora™ patients enjoy firmer, smoother, more radiant skin that contributes to an overall younger appearance. Patients can prolong results with follow-up treatments, proper sun protection, and an appropriate daily skin care regimen. 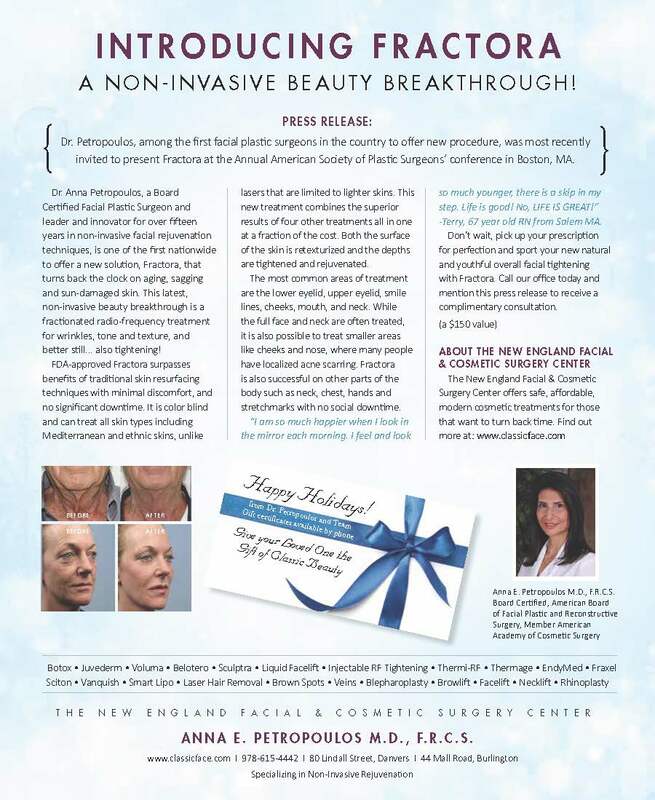 If you are interested in Fractor Skin Rejuvenation, call our Danvers MA office at 978-739-9500 to schedule a consultation with Dr. Anna Petropoulos.